I may be a day late, but these pancakes were worth the wait; the sweet and creamy savoury flavours in amongst the batter taste great. 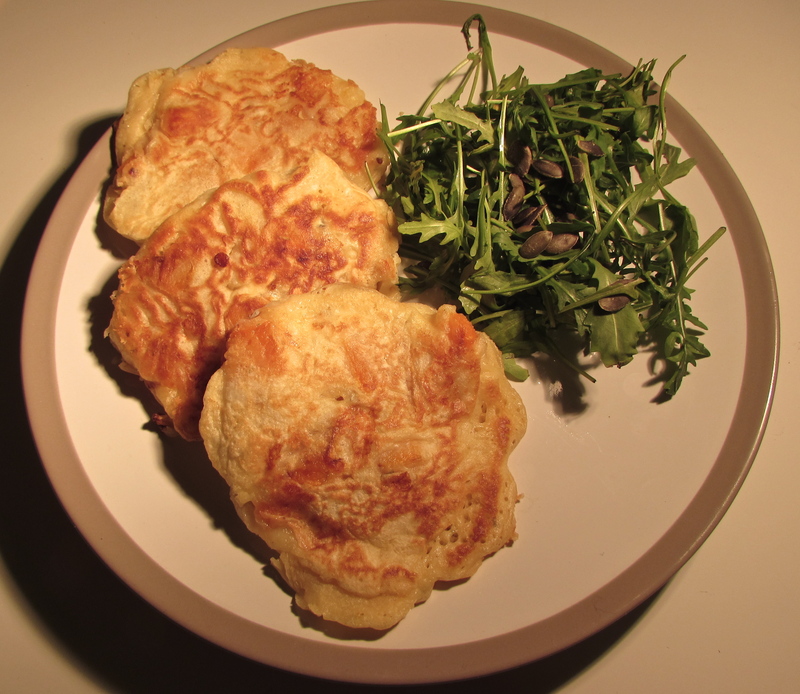 I won’t attempt anymore poor poetry, but if you’ve not tried making savoury pancakes before, I would recommend giving these a go. This recipe uses a traditional pancake batter with the addition of sweet and soft butternut squash, smooth and creamy goats’ cheese, and a hint of rosemary. The peppery rocket salad compliments the pancakes well and the pumpkin seeds add a bit of crunch. You could serve them for brunch or a light evening meal. 1. Peel, deseed and slice the butternut squash. Cut into small cubes, around 3cm. 2. Put a small frying pan on a medium heat and add a knob of butter, along with ½ tbsp oil. When the pan is hot, add the squash and fry for 10 minutes, stirring occasionally, until the cubes start to brown up. 3. Meanwhile, put the flour, baking powder, rosemary and a pinch of salt in a mixing bowl and stir together. 4. Pour the milk into a jug and beat in the egg. 5. Make a well in the centre of the flour mixture and pour in the milk and eggs, and the melted butter. Whisk together thoroughly until it forms a smooth batter. 6. When the squash is ready, tip it into the batter along with the goats’ cheese. Stir well until the fillings are evenly dispersed among the batter. 7. Place a large frying pan on a medium heat and pour in ½ tbsp oil. Add three ladlefuls of batter to separate parts of the pan, and cook for 3-5 minutes, until the batter begins to bubble. Flip the pancakes and do the same on the other side. Cook until golden brown on both sides. Do this in three batches, placing the cooked pancakes under the grill to stay warm if needed. 8. Serve with some rocket and pumpkin seeds drizzled with a touch of lemon juice and plenty of seasoning. The pancakes definitely need a sauce with them; I had mine with some sweet chilli sauce which was tasty. This meal was inspired by James Martin’s BBC Good Food recipe.